Yesterday I blogged on the My Digital Studio my December Design Team assignment, and it was about incorporating MDS in your home decor. With December being such a busy time for all of us, I wanted to share a little creative inspiration that doesn’t take long to execute (but that still packs a punch). Stencilling in home decor is always trendy and there is nothing easier than fabric printing. Silhouettes, typography, and geometrics can all be used creatively around your home and with MDS it couldn’t be easier. Making your own stencils is a breeze, especially if you have an e-cutter (but it’s not essential). You can simply scale your image to size in MDS, print it on normal copy paper, tape the paper securely to a cutting mat, lay a piece of window sheet over the top, and tape that into place. Then using a scalpel and a steady hand, you can cut away around your design. In July I was privileged to attend a special demonstrator incentive trip in beautiful Utah. 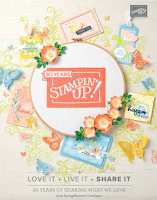 For every incentive trip, Stampin'Up! gives us fabulous pillow gifts and this year our gifts were presented in cute hessian/burlap bags. I kept the bags thinking I would reuse them for some of my presents this year but then it hit me: I wanted to keep them for myself, so I turned them into throw pillows! And one quick stencil later, I managed to introduce one of my favourite images to my living room home decor. And you know the best thing about these? I didn’t use any special fabric paints; I just simply stencilled using some regular wall emulsion paint. It took me longer to style the cushions for the fabulous photo than it took to put them together. I love how they turned out. In less than an hour I managed to add some seasonal art to our room that I will be able to keep out for the whole winter season. I would like to mention a few points regarding stencils. Once cut out, I used a layer of multipurpose glue around the shape (especially around the fine lines). Once dry, this becomes repositionable and it will allow you to keep it secured to your fabric. While stencilling, you do not want to risk moving the stencil and distorting the image. Start with a little paint on your brush then gradually build the intensity again; too much paint on your brush could bleed around the stencil and ruin your image. Wash the stencil in warm water after using. And if you would like to make a pair of pillows and your design is a silhouette, flip the stencil over and have the silhouettes facing each other. Fabulous idea Monica, thanks so much for sharing - I have a silhouette cutter on my wish list for Christmas! I tend to only use Stampin Up for home decor & accessories & gifts rather than greetings cards so great to see some more ideas! Really cute pillows Monica. You are so talented. However, I LOVE those white chairs. I am looking for some just like that. Love ya! Wow! Awesome idea, Monica! Burlap is one of my favorite texture.